SHOWCASE HOME: Be a part of Westhaven at 1409 Westhaven Blvd. 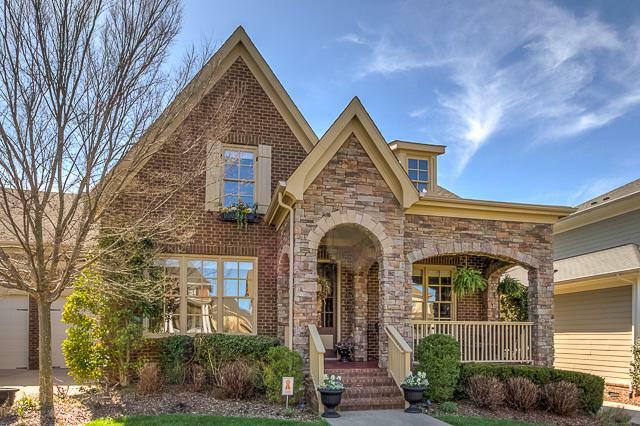 This Westhaven home is 3,336 square feet of wonderful. Located at 1409 Westhaven Blvd., you’ll love the curb appeal of the brick and stone front elevation and the beautiful backyard that overlooks a large, tree-lined greenspace. Best of all, by being in Westhaven, you have access to all the things that make this community one of Williamson County’s most desirable. Listed at $609,900, this four-bedroom, three-and-a-half bath home has a full back yard with room for a pool – though with Westhaven’s private waterpark so close you may never put one in. The large and shaded front porch is quintessential Westhaven, home to the annual Porch Fest. Use it to extend your entertaining space or to just relax and enjoy the view. The open concept and smart design of this beautiful home provides the perfect balance between form and function. The large formal dining room has generous natural light and views. Crown molding, a chair rail and wainscoting help define the space. In the great room, a high sweeping ceiling, elegant fireplace and built-in cabinets provides a dramatic and relaxing place for the all your daily activities and large family get-togethers. The kitchen features premium cabinets, plenty of cabinet storage and quality stainless appliances and generous granite countertops. The center island expands your work space, and there’s plenty of cabinet and drawer storage in addition to two pantries. The large breakfast nook and bar seating provide many options for casual dining and getting together with family and friends. The spacious first-floor master bedroom features a double trey ceiling and hardwood floors. In the master bath, relax in the large soaking tub, enjoy the separate shower and appreciate the private water closet. The dual vanity area features a large framed mirror, sitting station and plenty of storage. The extra-large bonus room provides great flexibility. It can be a media room, playroom or home office – if it’s your home, it’s your choice! There are three additional upstairs bedrooms, including one with its on privacy hallway, full bath and large closet. The screened-in porch provides plenty of room for outdoor dining and entertaining. Convenient to the great room and kitchen, it’s a wonderful extension of your living space and has direct access to the patio and back yard. Zoned for Pearre Creek (only two blocks away! ), Hillsboro Middle and Independence High schools, this home has garage parking for three vehicles. Contact Matthew D. Magallanes with Westhaven Realty at 615-483-7547 today to arrange a showing or for more information.